According to a timeline by retired law enforcement officer Jim Fisher, 1916 was the first time a corpse was identified by facial reconstruction on a skull. In recent years, it has been seen regularly on television crime shows. In reality, it is used as a last resort, and often in parallel with other means of identification. 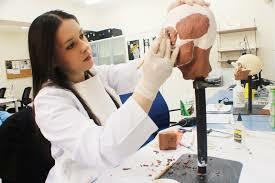 Craniofacial reconstruction combines the specialties of art, forensic science, anthropology, osteology, and anatomy. In 1895 German anatomist Wilheim His performed the first facial reconstruction by recreating the face of compost Johann Sebastian Bach. Another German by the name of Welcker furthered the study, and his technique is still widely used today. unusual “landmarks,” and determines the ruggedness of muscle attachments and profile of the jaw, symmetry of the nasal bones, and wear of the occlusal surfaces (biting surfaces of the teeth). When the study is complete, the jaw is attached with wax, and the nasal openings are filled with modeling clay. A plaster cast is then made of the skull. Once the cast is set, colored plastic pieces are attached at twenty one specific spots on the skull to represent the average facial tissue thickness. The rest of the features are added using modeling clay. Although this technique is used in criminal investigations, the Daubert Standard does not allow it to be used in court as expert testimony. There are multiple problems with facial reconstruction, the most pressing the disparity of data regarding facial tissue thickness. This disparity affects the accuracy of the reconstruction. In addition, there is not a standard process in approximating facial features. 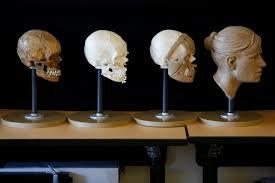 Despite these shortcomings, facial reconstruction has successfully identified numerous crime victims, and brought closure to grieving families.